Our instructor is a professional dancer with extensive training in all social dances, who began her career in Ballroom dancing specifically as a social dance instructor. This training shapes what she teaches and how she teaches it. In addition to technique she has studied how people learn, has read extensively on the history of dance and has studied many other dance genres which inform her understanding of movement and musicality. She has a clear teaching style attested to by many students (see testimonials). 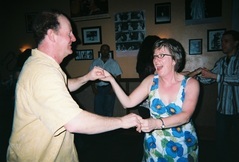 Twenty years of teaching experience has taught her the best and most effective means for students to learn how to dance and have fun doing it! 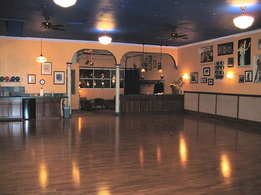 Our dance studio in Bozeman features a comfortable reception area, 12 foot ceilings, adequate ventilation and a warm, friendly and unique atmosphere in addition to parking and a location near to downtown. Our 30 x 40 foot dance floor is a floating sprung hardwood floor laid over a sprung subfloor which reduces fatigue and prevents injury. It’s the best dance floor in the valley. You’ve got to experience it to appreciate it! 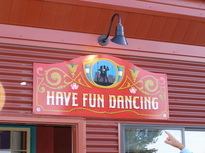 Have Fun Dancing hosts periodic casual dance parties where you can practice the skills you have learned in class, meet people and have fun! In addition to weekly dance classes and lessons, Have Fun Dancing hosts dance workshops with visiting guest instructors several times during the year. This attracts dancers from all over the West and gives local students the opportunity to learn from top international talent at a reasonable cost without having to incur expensive travel costs.